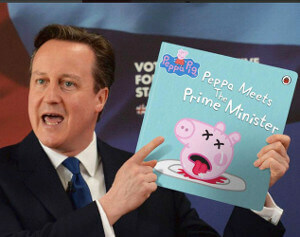 Prime Ministerial Legacy – They will generate their own power when pigs fly says David Cameron. If I have learned anything from my time on this Earth, it’s that people will do the dumbest of things to fit into and impress the human herd. The great ‘switch your energy supplier‘ game is a simple trick used to give ‘the herd’ an illusion of choice. Moving you from field to field doesn’t allow you to escape the farm that imprisons you. They lock you into a lifetime of unnecessary expense and keep you suckling at the teet of foreign-owned energy suppliers. How do I know this? 700,000 and counting households have managed to reduce dependence with solar panels, and yes the grass is greener on the other side of the cattle grid. Over the last few years, many of us ‘cash cows’ bravely pursued a future using alternative energy technologies. The former farmers/politicians left the gate open, just long enough for hundreds of thousands of us to begin to move away from their ever increasing energy costs. Unfortunately, those unimpressed energy companies have ‘installed’ a new farmer to slam shut the ‘green technology’ door and to prevent others from leaving their control. The incentives for alternative technologies are shamelessly removed for no logical reason, other than, they don’t want the herd generating their power. The privatisation of our energy sector was a contract signed to purchase the herd. An agreement that spans generations to keep the British public ‘locked in’ and milked every quarter. The rush across the cattle grid was unexpected but that our current crop of politicians intends to put right. Amber Rudd of the DECC (Department of Energy and Climate Change) has family ties that naturally come before the interests of our national energy and climate. Likewise, George Osborne’s family ties with the fracking industry at which unsuprisingly, have obvious conflict of interest issues. The cattle grid is an illusion. A barrier of fear that can be crossed quickly with a few carefully placed steps. It just takes a little determination to pass. During my early working years, I went from job to job looking for job satisfaction and a better pay deal. I found neither until I took an alternative approach. This is comparable to the ‘switch your supplier’ game. No matter how enthusiastic you are when you first ‘switch’, it’s just more of the same once your introductory offer ends. The early solar pioneers are the real heroes that I doff my cap too. People who look beyond the ‘not enough sunshine in Britain’ myths, Ruport Murdoch’s propaganda machine (yes, he has interests in the farmyard too), and who do their proper research to beat a system that is not in their best interest. The great ‘solar escape’ (as I now call it) has led to Saudi Arabia to becoming so concerned that they are flooding the world market with cheap oil to ‘break the back’ of the global alternative energy movement. Now that’s what you call real global influence! Of course, ‘the average man on the street’ doesn’t realise that these current low oil prices will be raised back up further, once the alternative technology movement evolves. The most significant reason of all to add solar panels to your roof and protect our national interests. “You can try to do a King Canute tribute act, but your plans for fracking are a very expensive production form that our USA cousins are now learning. Nuclear is more long-term, but astronomically costly from start to finish. While your darling the North Sea is going to need expensive’ end of life’ care. How does any of this reduce the national energy costs? The tide of expense is against you, and the Middle Eastern problems are self-inflicted and will turn against us. This leads to a conclusion that your recent decisions to ‘stamp out “green crap” based on our national interests, but your own personal or family gain. – You have sold the nation’s soul to foreign-owned lobbyists. None of this leads to cheaper energy bills or an economically viable country. £6.00 per household for solar technology as it currently stands is very much cheaper than the new cheque subsidies that you use to prop-up a privatised and antiquated centralised system that is so apparently failing in today’s geopolitical unstable world. Our children’s generation will look back at your time in power and feel nothing but shame, primarily as the government have known about the climate issues and the limited life of the North Sea since the age of Margaret Thatcher. To the people. The national penny will one day drop as more unintended consequences arise, and you don’t want to be in that crowd wishing you’d installed solar panels sooner. An alternative approach to energy suddenly seems a good idea – doesn’t it? We may think we’re individual, but the human herd has a strong pull. For once the human desire to impress could achieve real positive change in our fast deteriorating world. Don’t be part of the crowd scrambling to reduce their dependence because of super high-priced energy costs, caused by greed-based politics. Nationally, we’re putting all our eggs in a fracking experiment that will economically and environmentally fail. Additionally, our Middle Eastern warmongering will turn against us and the cost of heating all our homes. Someone from history once said, “you have to fight for your freedoms because they won’t give it to you willingly”. That’s the real reason why solar panels have come under attack recently, and that’s precisely why we need them.